The decade that passed can safely be called agrarian. For good or bad reasons, the world spent the decade talking about agriculture. Food grain price rise was the talking point across the continents. To note a landmark, the decade ended an era of cheap food. After the food crisis in 1974 there was a continuous decline of food prices for the next 25 years. In 2005, the trend took a reverse swing and prices of food doubled. They will remain high in the new decade as well. International Fund for Agricultural Development’s (IFAD) Rural Poverty Report-2011 states, “While international food prices have declined since mid-2008, they are still substantially higher than prior to the price surge, and they are likely to remain at 2010 levels or higher for the next decade.” The report estimates that about 100 million poor rural and urban people were pushed to the rank of the world’s hungry. For Indians, the story is no different. From 2000 to 2005 food grain prices declined with inflation rate in rural areas coming down from 8.1 per cent in 1993-2000 to 1.90 per cent in 2000-05. In 2007 when the Planning Commission prepared the poverty estimate for the country, the decline in poverty was attributed to low food inflation. But since 2006 food prices have been rising. Food inflation was about 14 per cent in December 2010. Indeed, rise in food prices in the past two years has been higher than in any period since the mid-1970s. From 2005 to 2010, the average wholesale price index for food articles went up by 40.76 per cent. The era of cheap food—it can be argued for and against— coincided with a sharp dip in public investments in agriculture in India as well. Structural change in agrarian countries took place during this period as countries no more found agriculture lucrative. It is small wonder that countries like India faced their worst agrarian distress during this period. In India non-agriculture employment of male rural workers increased from 22.2 per cent in 1983 to 33.6 per cent in 2000. Governments found import of food grain cheaper and easier way to get rid of food scarcity. The question now is: will this era of high price bring political interest in agriculture? Or how will this price-driven interest in agriculture help Indian farmers, mostly small and marginal? Before exploring this, let’s take note of another related development. As many experts say, India may soon be in a position to reap the demographic dividends. Such dividends come to a country when workforce in the age group of 15-59 years increases. More people work to increase economic output resulting in economic growth. India’s workforce is dominantly rural and consists of youth in the age group of 15-34 years. The dividend can be encashed if all of them are employed. At present, new workers join agriculture despite it being low paying. The challenge is to make farming productive for them. Here a crisis can become an opportunity that can avert another crisis, which is rural unemployment. Price rise provides an incentive to farmers and the government to plough back its investments and attention into farming. Of course, it needs a very effective mechanism to transfer the high price that a consumer pays to the producer. 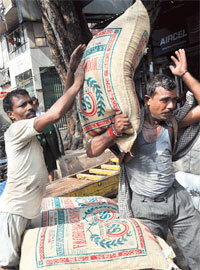 At present, producers hardly get a fraction of the price paid for food grain at retail. Rural unemployment is mostly in rainfed areas, which constitute 68 per cent of the net sown areas in the country. On the other hand, rainfed farmers have to contribute food grain substantially to ensure food self-sufficiency. The contribution by rainfed farmers is inevitable now as steep rise in food prices will discourage the government from importing food grain to bridge the gap of demand and supply. Studies show that agricultural growth is still the most powerful instrument of national growth and poverty eradication. One study estimates that one per cent growth in agricultural GDP increases the expenditures of the poorest 30 per cent of the population at least 2.5 times as much as growth originating in the rest of the economy does. Another study finds agricultural growth 3.2 times better at reducing poverty (US $1 per day) than growth in non-agriculture sectors. The situation, thus, is a winwin for both farmers and the government. To harvest demographic dividends and exploit price rise, we have to bring farmers in rainfed areas back to farming. They will come back if farming is lucrative enough. The current phase of high price can be used to lure them back by evolving right policies. “To sum up, the global environment of agricultural and food markets is evolving in a direction that appears to provide greater incentives for investment in rural areas of developing countries and greater opportunities for agriculture— including smallholder agriculture— to play a key role in driving rural growth and ensuring food security,” says the IFAD report. True, for the most part- reducing subsidy for food should technically improve the lot of the farmer and make agriculture a lucrative and productive "profession" for youngsters. (This happened in Israel in the 80s). However, for this revolution to occur, specially in the indian context of primarily subsistence farmers and poor politics (including the rural employment guarantee scheme- the greatest fake scheme on the planet), it will take a while. It needs to go hand in hand with education, basic health and better transport/ market networks. It is sad that we billions of dollars in building the golden quadrilateral without considering a smarter rail network or even a road system that can bring produce from the farms to the urban markets and make our rural economy strong indirectly improving the quality of the cities by reducing rural migration creating more shanty towns. Instead, we connected our metros which anyways are linked with flights and trains. We catered to the nouveau riche that wanted to drive its fancy cars on a fancy road. Rather than sink all that money on an unsustainable road system, we need to have put it on a superfast bullet train network connecting the 4 metros. But then, the politics of the coutnry has never bothered to think that far. It is about vote banks and money to fund the next election (coming from all those chaps who sell construction projects that will "cover" the costs).